The fact that Rod Kennedy is dying makes me incredibly sad. You may not know who he is, but I would bet that you know someone who has benefited from the world that he created. Rod Kennedy is the founder of the Kerrville Folk Festival, a yearly 18-day festival that's held out in the Texas Hill Country. But it's not just a festival, it's a community, or actually a huge extended family. And Rod is the conservative old-school-Republican ex-marine that put it all together and let it grow into one of the most amazing festivals ever. 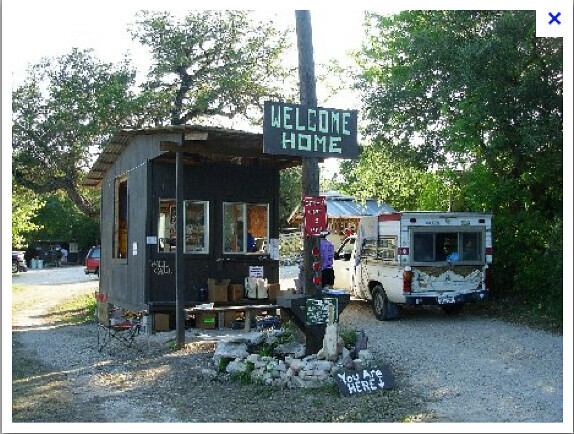 I find the "Welcome Home" sign at the ranch to be kind of hoaky, but I also know that it's true. Every time I got out there, I _am_ going home to my Kerr-friends and my Kerr-family. And I wouldn't have any of it if it wasn't for Rod. The community he created extends out into every corner of the world and creates ripples of good that run past all of us every day. I hope that he realizes how much good he has put out into the world. Thank you Rod. Putting good into the world. Yes so admirable. I'm sorry he is not well. Boy do I know that shack. I worked the graveyard shift in/near it for 2-3 years. So much fun. Sad to hear Rod is nearly gone.